Meta: The current EURUSD moves offer binary options traders amazing profit opportunities. Learn more about this popular currency pair. 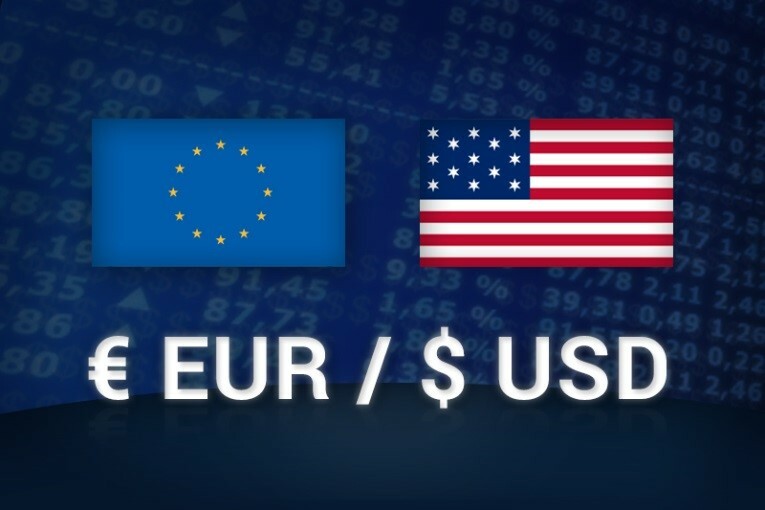 The EURUSD is the most popular asset in the binary options market. Traders love this currency pair because of its liquidity and constant volatility, which offers great opportunities for investors and binary options traders to profit. In the past month, the EURUSD shed off more than 400 pips and closed at 1.0973. The prospect of the EURUSD achieving parity (1.0000) before the end of the year is now looking like a distinct possibility. For binary options traders, this scenario would provide plenty of opportunities to make lots of cash. For instance, a trader on the Banc De Binary platform can trade Ladder options on the EURUSD with multiple bearish targets and expect to earn up to 500% returns on a single transaction. Since the beginning of March, 2015, the European Central Bank (ECB) started implementing its $1.1 trillion Quantitative Easing (QE) that is slated to run through to September, 2016. This program was aimed at boosting the less than impressive economic recovery in the region. That program entails buying bonds with freshly created money, effectively pumping cash into the banking system in the hope that lending and borrowing will be encouraged, thus boosting the economy. At the time, the value of the euro (EUR) was also very high and this was hurting the performance of exports from the region. Exporters are key contributors to economic growth and jobs in the region and it was vital that the program should be implemented. 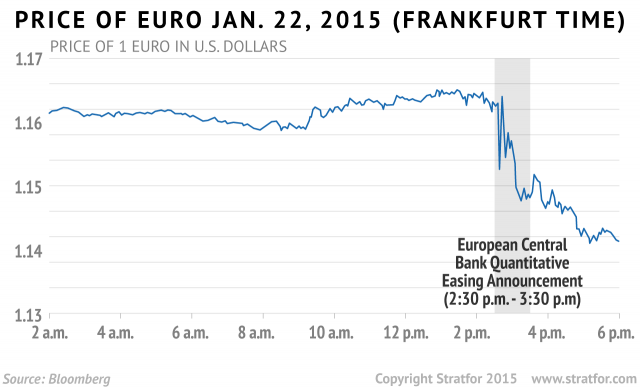 A higher euro was also weighing in on imports and this weakened inflation. In the second quarter of 2015, Europe’s economy grew by 0.4% but unemployment remained high at 11%. With this in mind, ECB’s president Mario Draghi, in his recent speeches, has continued to reiterate that the program could be expanded or extended beyond September, 2016. This could continue weighing down on the euro for the foreseeable future. 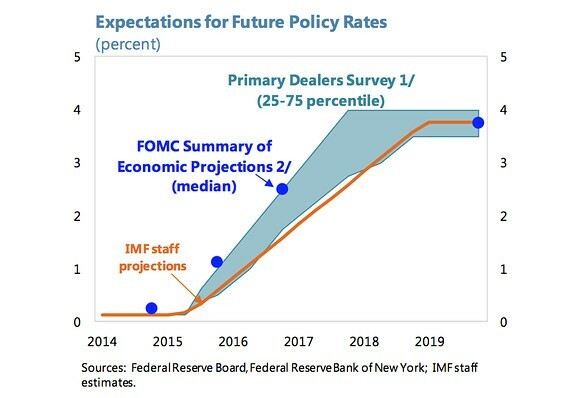 In contrast, the US Federal Reserve (Fed) continues to give indications that it will hike its interest rates for the first time in 7 years as soon as December, 2015. A higher interest rate regime in the United States will boost the value of the dollar (USD) as investors will now make more dollar-denominated investments. The United States has witnessed decent economic growth and hiking the rates soon is an extremely likely scenario. In fact, when questioned, Federal Reserve Chair Janet Yellen expressed the chances of a US rate rise in December as a “live possibility” This will continue boosting the value of the US dollar while simultaneously putting pressure on the euro. The most recent US Non-Farm Payroll Report released on 6th November, 2015 showed that 271,000 jobs were created in the month of October. This was way above analysts’ expectations of only 179,000 new jobs. The unemployment rate also ticked lower at 5.0% (a 7-year low) compared to 5.1% in the month of August. 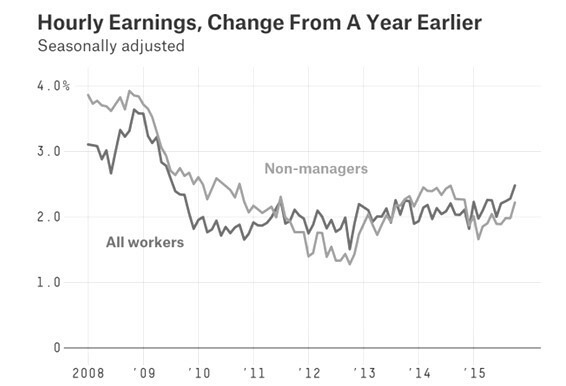 The average hourly earnings also showed a 0.4% improvement against analysts’ expectations of 0.2%. This strong data fuelled expectations of a rate hike before the end of the year and the US dollar immediately posted gains over other currencies. In addition, the EURUSD alone shed off almost 150 pips minutes after the report was released. The October US labor report surprised the market and the EURUSD continued its downward slide. The rise in employment numbers is expected to have an immediate impact on retail sales and consumer spending which are also important economic indicators that traders watch out for. If retail sales and consumer spending improve in both the months of November and December, a rate hike this year will be inevitable and the EURUSD weakness will continue. If, however, retail sales and consumer spending figures come in softer-than-expected, a small EURUSD recovery can be expected but analysts suggest that any rally will likely be capped below 1.0900. It is also expected that the monetary policies of the ECB and the Fed will continue to be more divergent- a scenario that will continue to push the EURUSD towards parity. 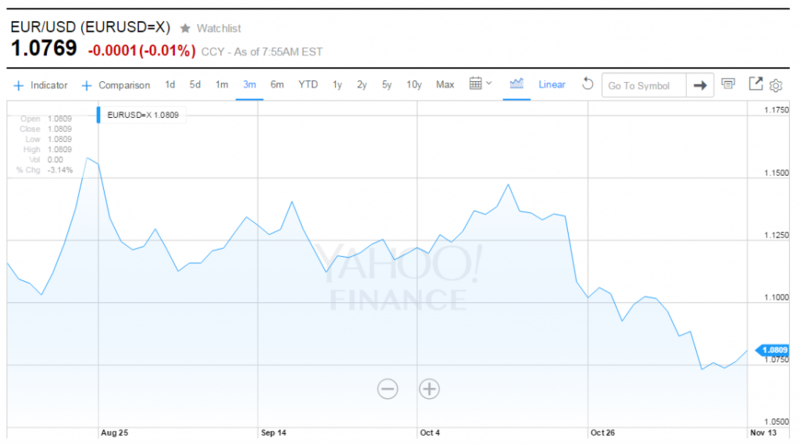 As the year comes to a close, volatility in the currency markets is expected to rise. This is because most multinationals and large fund managers close their foreign books towards the end of November and this can cause volatility particularly in the EURUSD pair. The volatility caused can be non-directional and traders, especially in the binary options market, can have many profitable opportunities to exploit. Since the beginning of October, the EURUSD has shed more than 400 pips and all charts point to a clear downtrend. After the October jobs report was released, the pair briefly broke below the 1.0700 handle and traders now expect to take out the psychological support around 1.0460 (which is the 52-week low posted in April, 2015). If this level is taken out, parity will likely be achieved sooner. Currency moves are also known to overshoot and if the support of 1.0460 is breached, a move below parity to multiyear low at 0.8500 cannot be overruled. Trading the EURUSD during these times of divergent monetary policies between ECB and the Fed can be very profitable for investors and binary options traders. Take the time to follow the financial news closely to get some more insight into this popular currency pair.